Soils and Stone supply decorative aggregates to any location in the UK in a wide range of colours from rainbow to granite! All materials can be supplied in the loose or via industry standard bulk bags. Our delivery options include grab, tipper or hiab crane off-load. Gabion stone is used for the stabilisation of earthworks and is increasingly popular as a fill stone in Gabion baskets where a quick solution is required for retaining walls and ground stabilisation projects. 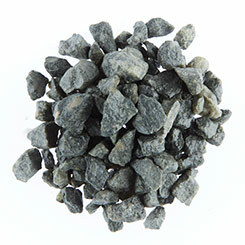 Gabion stone is also used in hard landscaping projects such as feature walls. All materials are delivered in the loose or via industry standard bulk bags. Our delivery options include grab, tipper, hiab off load or artics (site constraints permitting). An attractive landscaping aggregate particularly where you want to make an instant impact. • colours include grey, black, apricot, ice blue, mint and white. 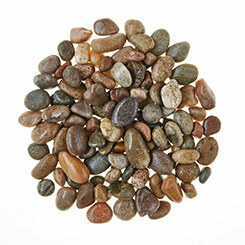 Soils and Stone supply a wide range of 14mm–20mm and 20mm–50mm pebbles to suit all tastes. A brilliant addition to any landscaping project, pebbles are available in a variety of colours and finishes, and add an eye-catching touch to water features, driveways and borders. 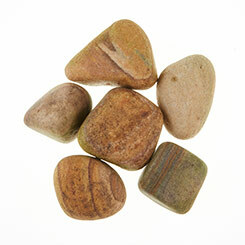 If you want to create instant impact, pebbles are a great investment! Our 4mm-10mm, 4mm-20mm, 20mm-40mm stone provides instant impact and an attractive finish to any landscaping project. Available as limestone or granite, this is a naturally quarried product, so there may be slight variations in formation, colour or shape. 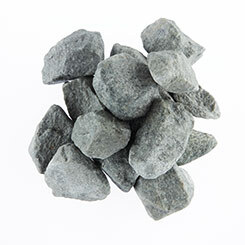 A blend of rounded and angular stone that is free from fines, our 40mm stone is widely used as a decorative aggregate in landscaping projects. This naturally quarried granite, flint or limestone so there may be slight variations in formation, colour or shape.